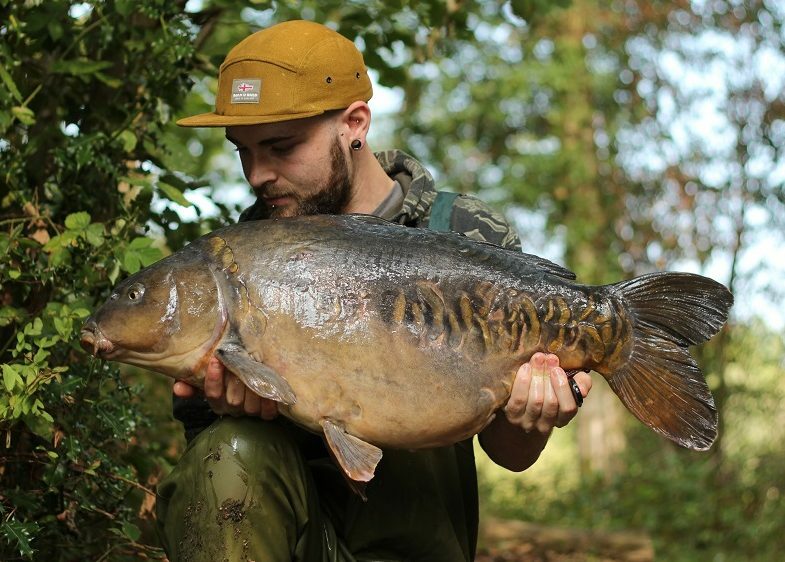 Top carper Dave Williams recalls his exploits from a successful mid-summer on his regular Yateley waters..
August is renowned for being a slow month of fishing on this lake and it lived up to its name. The searing heatwave continued on, the weed was ridiculous and the fish just weren’t feeding. My first trip of August I went in a swim called ‘Reeds’. I’d fished it before but never caught from it. A started with a balanced Frenzied Tiger Nut on each rod fished over some Frenzied hemp, tigers and CompleX-T boilies, both fished in nice firm areas. I felt confident but in the end I didn’t have any interest on that trip. I put the rest of my bucket of bait out into the spots before I left as it was a swim that didn’t get fished that much so I felt it would be worth baiting up. I returned the following week and as as expected the swim was free. Unfortunately however, there was someone fishing to my left which meant that I couldn’t fish the one spot I had baited. I ended up fishing both rods side by side in the other spot in the same manner as the previous week. The following morning there was a lot of fizzing coming from the spot I hadn’t got a rod on, typical! The bloke fishing next door did leave early afternoon however and I managed to get the rod in area I couldn’t fish the night before. The night was full of sounds of big fish showing to my right and I felt confident of a take at first light. It was about 8am when I eventually got the take and it was clearly a very powerful fish. I had it under control for a short period before it buried itself in a weed bed and my barbless hook pulled. Gutted would’ve been an understatement! I packed up that afternoon after baiting the spots again and planned on fishing the same swim the following week. When I turned up for my next trip the fish had moved round into the middle section of the lake again and it had done one of the big fish. I settled back into a swim known as ‘Dead Mans’ and fished the spots that had produced for me before. I opted to fish boilie hookbaits this week instead, as everybody else seemed to be fishing tiger nuts. I received no action through the night but did get a take early on at about 5am. I lifted into the fish and the rod arched over and then it all sprang back slack. Upon retrieving the rig, my lead was still attached and the hook point was fine so I think it must have be a fish trailing line. Unfortunately that was the last of the action that week! 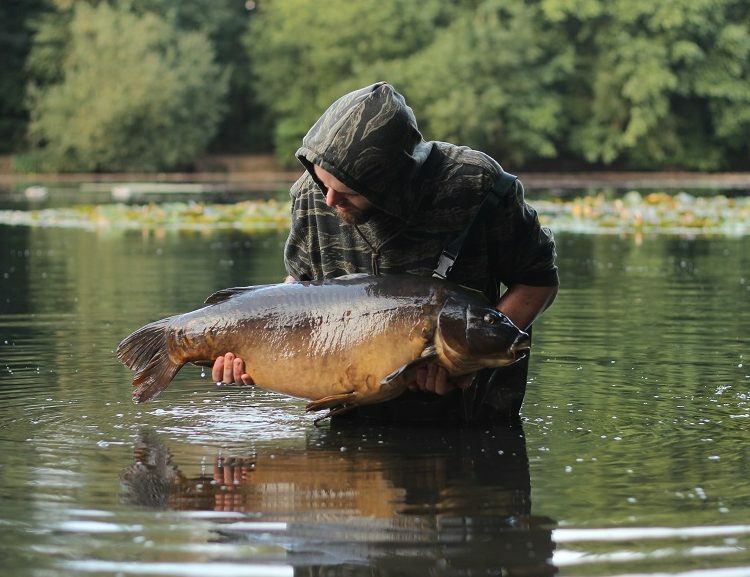 The following week I fished a swim called ‘Mangrove’. It’s the swim next door to ‘Reeds’ swim and I fished the spot I’d lost the fish in Reeds from Mangrove. 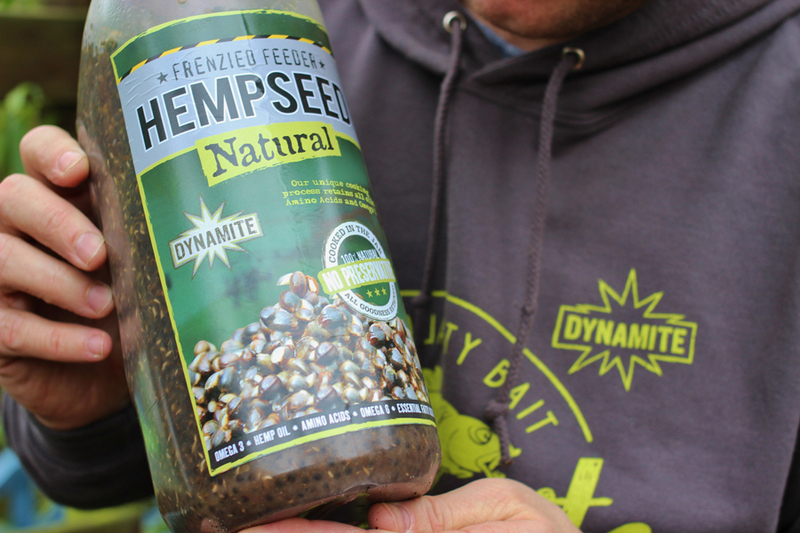 I fished boilie hookbaits again over a mix of Frenzied Hemp and Tigers and some free CompleX-T offerings. I received no action through the first 24 hours although I had noted several other spots that the fish had fed on that morning. I reset the rods in the new spots and struggled to find shade all afternoon to try and avoid the sun. Evening fell and and the action seemed to die off a bit. I figured that this was the turning point and I needed to alter my baiting approach to get some more bites. I did a lap of the lake as I left and managed to find some fish in the margins of a swim up the other end. I found two spots and baited them and was eager to make my return. The following week was the first week of September and I managed to get back in the swim I’d baited the week before. There were several fish in the area so I flicked the rods out into the spots. The rigs this week were baited with some hard salty CompleX-T 18mm bottom baits and the spots were baited with half a kilo of Crave and CompleX-T freebies. All night I could here fish rolling in front of me and I was super confident of a take at first light. My left hand rod ripped off at about 7am. Unfortunately my run of bad luck continued and the fish got snagged on some old line hanging from a nearby tree and I lost the fish. I redid the rod and sat back confident of another chance. There were about five fish cruising round in front of me and all of a sudden my other spot started fizzing away. I sat on my hands for about five minutes before the rod ripped round and I landed a lovely 36lb mirror. Finally I’d landed one! I redid both the rods again that afternoon and felt confident of some more action the following morning. Unfortunately it wasn’t to be and I prepped a few spots before I left. I couldn’t make it down the following week due to commitments at home but the week after I got down right in time for a nice change in the weather. It was overcast, drizzly and very windy. I arrived at the lake with the idea of getting in a swim called ‘Niges’. It would see the brunt of the fresh wind and I had a good feeling about it. When I turned up at the swim however I was met by a guy who’d just got there and was mid set-up. I moved then round to the other end of the lake into a deep silty area off the back of the wind. I found some spots I’d fished before that were still there and still clean and flicked out a couple of CompleX-T 18mm bottom baits. I then complemented the rigs with about 30 or so free Crave and CompleX-T 18mm freebies. The first night was fishless but I did see quite a bit of activity that morning so I stayed in the swim, recast the rods and crossed my fingers for a fish. At some point around first light I had a melting take and landed a nice clean looking 32lb mirror. September was being very kind to me! I didn’t manage to fish for the rest of the month, but here’s hoping October will be productive!